Marvel has announced the cast for their new, ever expanding list of T.V. shows, The Inhumans. The show was originally planned as a movie, but for reasons unknown to me, those plans fell apart. The Inhumans have already been introduced in Agent of S.H.I.E.L.D, and now they are getting there own 8 episode series. In these next few posts, I'll be going over the first appearances of the Inhuman Royal Family that has already been cast. They are going to be mostly volume one of Fantastic Four, which, surprisingly, I have yet to even mention. So, without further ado, let's get to it. Since I'll be going chronologically, the first issue to get mentioned is Fantastic Four #36. It is currently being sought out because of the first appearance of Medusa. She is going to be played by Serinda Swan in the upcoming T.V. series. But that's not all of the key issue goodness that this comic has to offer. 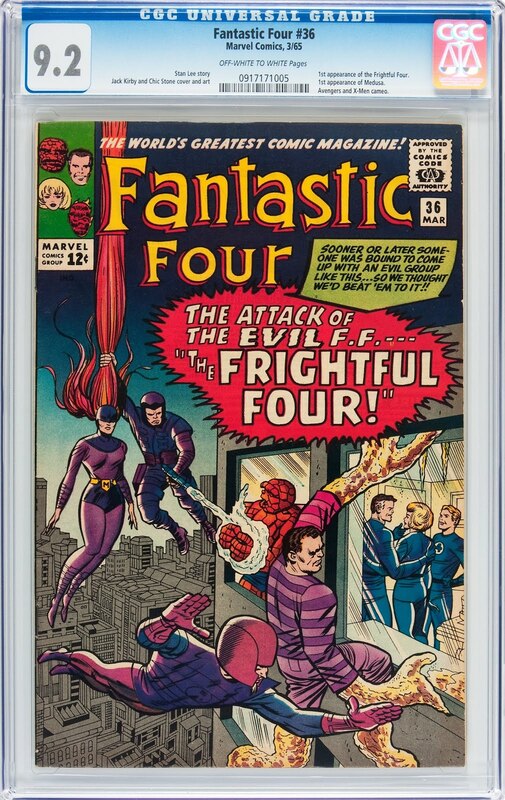 It also has the first appearance of The Frightful Four. With this issue, it'll probably be best if I start at the beginning. When we first open up this comic, we see Reed Richards and Sue Storm being hounded by the paparazzi over their wedding engagement. It isn't until we hit page three that the baddies show up, and that's where the key issue stuff starts to happen. On an lonely, empty wharf stands Paste Pot Pete, waiting for Sandman and The Wizard to discuss how they would be able to defeat the Fantastic Four. They all decide that it would be best to form a team themselves, an exact "opposite" of the Fantastic Four if you will. There was one thing missing from this new team of super villains, and that is a female member. It's a good thing that the Wizard knows exactly where to find this villainess, whom he claims is more powerful that the Invisible Woman herself. The Wizard had heard rumors of an all powerful woman on a small island in the Mediterranean. This woman turns out to be none other that Madam Medusa. She doesn't have snakes protruding from her head like the mythological version, but she does have control and can manipulate her hair at will, as well as other abilities. Not the coolest of powers, but hey, who am I to say anything. I've never created any superheroes or villains. Anyway, Medusa joins the trio of evil men and the Frightful Four is assembled. Having formed their new team, they go off and try to execute their plan to bring down the FF. She is also the wife of the silent leader of the Inhumans, Black Bolt, but we won't learn about this until a later issue. I should also note that the X-Men and the Avengers make a cameo appearance in this issue. They are all gathered together, at what I can only assume is the Baxter Building, for an engagement party. 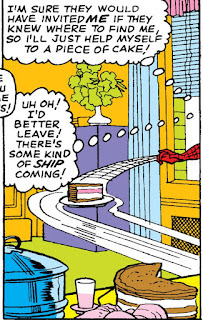 And if you look closely, there is also a very very brief appearance of Spider-Man's arm. 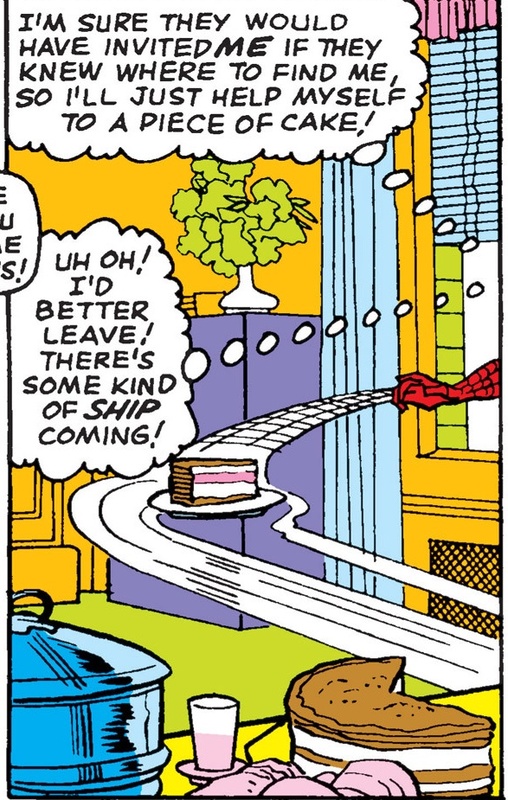 Spidey's gotta crash a party and snag himself some cake. This is a fairly new section where I try to look for available variant covers for comics, but unfortunately for this comic, there are none, or at least none that I could find. Some of the Silver Age books that came out around this time have UK pence copies, but not for this issue. There will be some pence copies for a couple of the next issues that I will be talking about though. To date, there have been 709 copies listed in the CGC census. There's pretty even mix of high grade 9.4 NM copies all the way down to a low grade 3.0 G/VG. There are a few higher graded copies with only one copy topping out at a Universal 9.8 NM/M. I can only assume that a lot of these copies have been submitted over the last couple of years because before there was any hype about a movie or T.V. show, this wasn't a very sought out comic. You'll be able to see what I mean in the Value section coming up next. When you look at the value of this comic over the last few years, you can see that this was once a bargain bin comic. Yes, I am using that term loosely. It wasn't exactly in the dollar bin, but it wasn't even close to demanding the prices that they are today. For this, I'm going to use 7.5 VF- graded copies as an example, only because it has the most sales over the last few years. During the Inhumans movie rumor mill period back in 2011-2012, 7.5 VF- copies were only selling in the $115-$145 range. Once it was confirmed in 2014 that there was a movie coming out, values very quickly shot up over the $500-$600 almost overnight, with one sale almost reaching the $1,000 mark. Values hovered around the $500 range for quite a few months after the beginning of 2015, that was until it was confirmed that there would not be an Inhumans movie after all. After that, values started to plummet down below the $300 mark. But, with the news that there will be an eight episode T.V. show coming out, prices may be on the rebound. Only time will tell. Now why do I think that most of the copies in the CGC census were submitted over the last couple of years? Because of that huge boost in value. Once people saw that this comic was now worth something, a lot of people sent in their copies to be graded. That may have also had an effect on the values too. There were more copies in the market. It's all about supply and demand after all. Now that prices have come down, it may be a good time to snag a copy of FF #36. Whether values will jump back up to where they were in the near future remains to be seen. I definitely have my doubts, but I've been wrong in the past, and I'm sure I will be wrong many more times in the future. Happy hunting my fellow collectors and investors. Great description of FF #36, Medusa's first appearance. 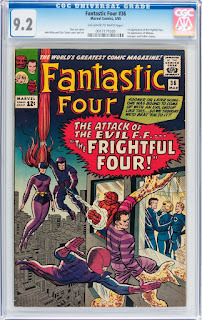 It is true that the Frightful Four had more success with Medusa as a member, than they did in later years with any number of different fourth member replacements. Hi John. It took a bit of reading and research for this, and all of the posts that I do, so thank you, I'm glad you enjoyed it.